Tokyo – together with Paris, New York and London – is one of the most exciting fashion centres in the world. However, in comparison to those cities, Tokyo has a wider diversity of styles, at least according to Philomena Keet. 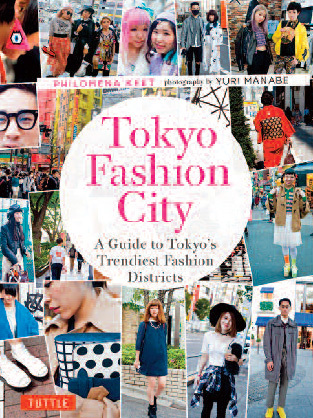 In 2007, the British anthropologist and fashion enthusiast published the acclaimed The Tokyo Look Book, and now she’s returned to the same “crime scene” in order to present some of the city’s most interesting fashion districts in more detail. Keet came to Japan after graduating from the University of Oxford, and taught English in Osaka for two years. Then she completed an MA in Japanese Studies at SOAS University of London, followed by a PhD in anthropology focusing on Tokyo street fashion. Rather than in fashion per se, she’s always been more interested in how differently from Europe and America young people in Japan treat their clothes and appearance. This interest became the basis for her two books. One of the more apt keywords to describe Tokyo is ‘cacophony’. Wherever you go, you’re assaulted by a cacophony of noises, sounds, colours and lights. But Tokyo is also a cacophony of dressing styles, as Keet points out in the book’s introduction, and the really interesting thing is the extremes to which the locals will go to pursue and parade in the streets to show off their very personal, sometimes even quirky, fashion sensibility. I’ve just used the word ‘quirky’, but one of the best things about this book is that Keet doesn’t just focus on the weird side of Japanese fashion and pop culture, as too many other publications do. Among the book’s pages there’s space for everything, from goth and otaku styles to more mainstream and traditional wear. According to Keet, the best word to describe Tokyo fashionistas is ‘fanatical’. In the same way that the Japanese are famous for their sometimes maniacal attention to detail, those who are into showing off their fashion sense are not afraid of pushing the boundaries of a certain style, often creating new sub-subcultures. This attitude is prominently on display in the book’s 350 colour photos. In the spirit of the book’s approach to fashion, all the pictures featured in it (by Keet’s usual collaborator Yuri Manabe) are street snapshots. These images highlight the fact that, in Tokyo, you don’t have to go to a fashion show in order to see new, original or improbable outfits actually worn by people like you and me. Probably because Japan’s history of Western fashion is still relatively recent (only about 150 years old), the Japanese feel free to play and experiment with imported garments, and to mix them with Japan’s traditional fashion, thus creating completely original hybrids. In Tokyo, Keet says, one can revel in looks ranging from the mundane to the extravagant without fear of drawing public criticism or unwanted attention. Even the most outrageous outfits often fail to cause a reaction as people in Tokyo tend to blank out strangers in the streets or on public transport. Part guidebook, part fashion photo album, Tokyo Fashion City takes readers on a stroll through eight districts, which each have a reputation for an interesting fashion scene, be that cutting-edge, traditional or known for embracing a subculture. From Harajuku’s outlandish street fashion to Shibuya, birthplace of the gyaru gals and their sophisticated youth culture; hipster hangout Daikan-yama to Shinjuku and Ikebukuro’s famous department stores; bohemian Koenji, where alternative and vintage stores rule supreme onto otaku neighbourhoods such as Nakano and Akihabara; Ginza’s swanky boutiques, patronised by elegant ladies and dapper gentlemen, all the way to the narrow lanes of what the book labels East Tokyo (actually still quite a central area, as almost all these districts are located west of the Sumida River), where everyday Japanese fashion gets a traditional touch. Tokyo Fashion City works especially well as a primer for people who don’t know the city or its fashion scene well, but even Tokyo veterans will find some interesting bits they didn’t know about.